Whichever side you’re on, you have to admit that surprising each other is an important part of a loving relationship, be it on Valentine’s Day or any other day of the year. 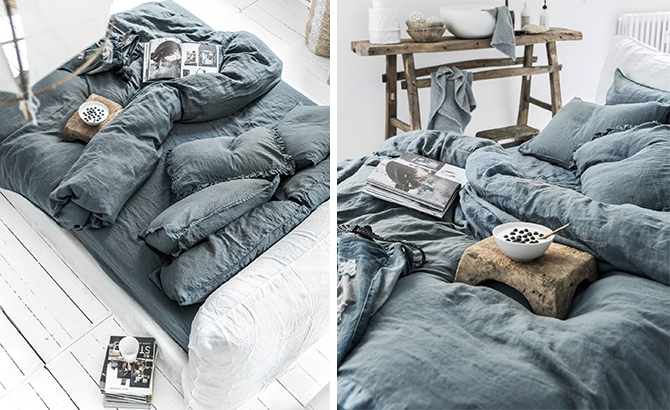 And truthfully, we can’t imagine a gift that’s more functional AND romantic than bed linens. 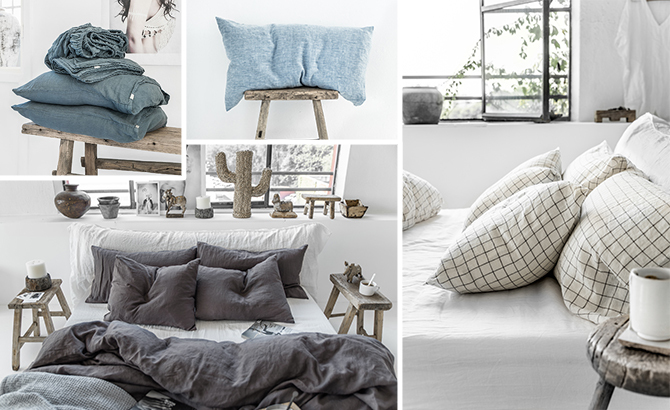 By gifting linen bedding, you’re gifting quality, comfort, style. Linen bedding is naturally hypoallergenic, which means it lowers the chance of allergies and guarantees the best night’s sleep ever. 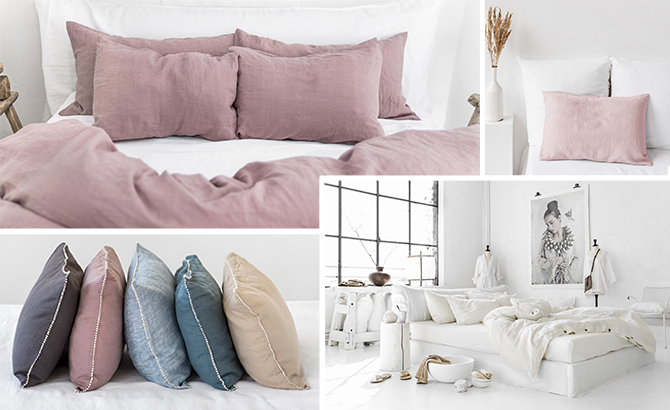 If you are looking for the best Valentine’s Day gift or something special for any other occasion, here’s our selection of luxury linen bedding sets for couples. While red is probably the most obvious choice for Valentine’s Day, not everyone loves such bright and vivid colors. Especially when it comes to bedding, it’s best to go with more muted colors that will complement and tie together the entire room. Our woodrose linen bedding sets are a wonderful choice for someone who wants to evoke a feminine touch without it seeming too girly. The dusty pink shade matches well with many other colors, from white to grays, browns, and even lighter blues. 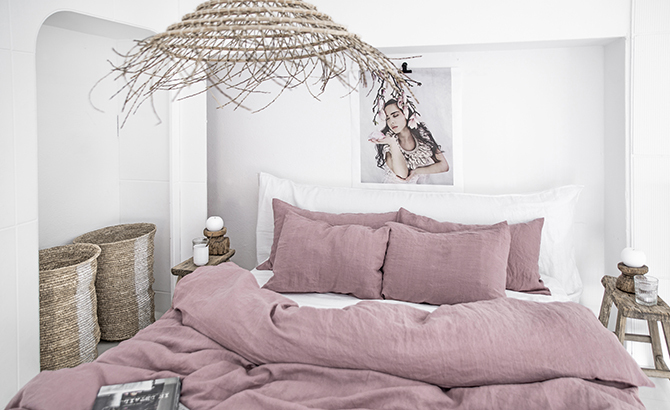 Those who prefer lighter shades will enjoy our light pink color or can even go as far as white linen bedding, which gives off that sense of freshness and purity. On the darker side, there’s purple charcoal, which can be spiced up by adding white pom pom details to it. As a rule, men tend to be more conservative with their bedding choices. Most common colors are navy, black, shades of gray and brown. 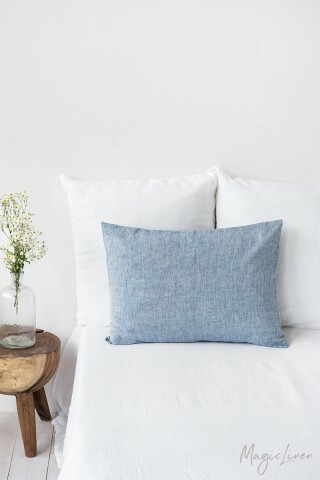 Our gray blue linen bedding sets have proven to be the most popular with both men and women for they are neutral enough to complement other colors in the room, but eye-catching and trendy too. Continuing on the blue note, guys love the lighter shade of blue melange, which has blue and white threads woven together to create a unique, denim-like texture. For those who would like to go all-white with their bedding but do worry about its cleanliness, we’d recommend choosing patterned bed linens, like our charcoal grid collection. The subtle windowpane pattern will mask spots and make your bedding look fresh longer. Lovers of classic gray will appreciate the light gray and charcoal gray shades of our linen bedding. 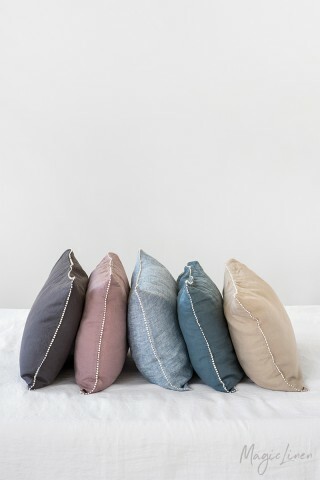 Neutral but still warm and cozy, these colors are created to be easily mixed and matched with other bedding items and will work in any interior, be it modern lofts, artsy studios or rustic farmhouses. Ultimately, all of these colors can work for both men and women. If you are unsure of which one to choose or need to match it to existing bed linens, you can always get our home textiles fabric samples free of charge! 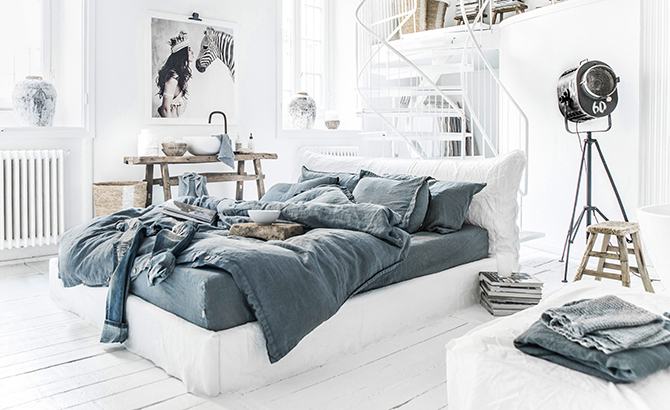 It's the perfect way to find the absolute perfect linen bedding set. Learn which fabric is best for you based on your sleeping habits. 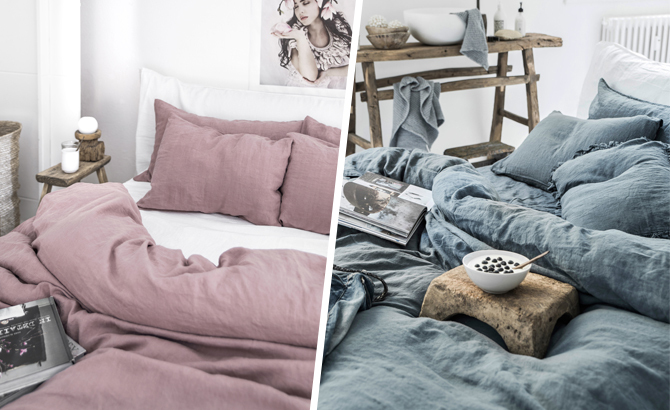 Learn about the difference of bed sheets and find out which one's right for you. 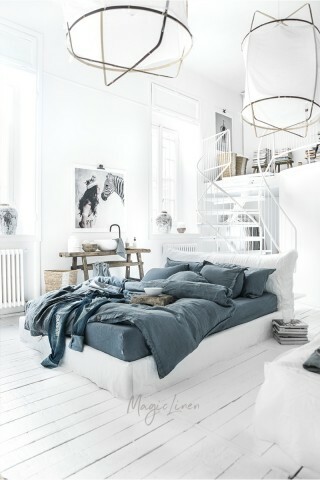 A range of stylish color schemes to inspire your bedroom decoration.